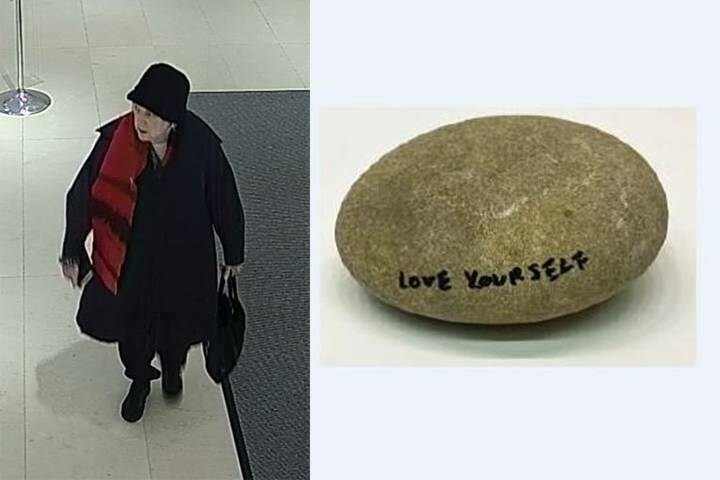 Photographs of a woman who looks as though she could be a sweet grandma have been released by the Toronto police after a rock inscribed by Yoko Ono went missing from the Gardiner Museum in Toronto this Friday (April 6). The 85-year old artist, musician, filmmaker, and peace activist had written on the rock as part of a three-part interactive installation titled Yoko Ono: The River. According to the museum, it “features a pile of river stones that have been honed and shaped by water over time”, and Ono has inscribed some of the stones with words, such as dream, wish, and remember. Visitors are invited to hold the stones as part of the interactive exhibition although, not, as the woman allegedly did, put them in their bags and take them away. The rock that was taken had “love yourself” written on it in block capitals.